Fountains Abbey is one of the largest and best preserved ruined Cistercian monasteries in England. It is located approximately 3 miles (5 kilometres) south-west of Ripon in North Yorkshire, near to the village of Aldfield. Founded in 1132, the abbey operated for 407 years becoming one of the wealthiest monasteries in England until its dissolution in 1539 under the order of Henry VIII. The abbey is a Grade I listed building owned by the National Trust and part of the designated Studley Royal Park including the Ruins of Fountains Abbey UNESCO World Heritage Site. After a dispute and riot in 1132 at the Benedictine house of St Mary’s Abbey, in York, 13 monks were expelled (among them Saint Robert of Newminster) and, after unsuccessful attempts to form a new monastery were taken under the protection of Thurstan, Archbishop of York. He provided them with land in the valley of the River Skell, a tributary of the Ure. The enclosed valley had all the natural features needed for the creation of a monastery, providing shelter from the weather, stone and timber for building, and a supply of running water. After enduring a harsh winter in 1133, the monks applied to join the Cistercian order which since the end of the previous century was a fast-growing reform movement that by the beginning of the 13th century was to have over 500 houses. So it was that in 1135, Fountains became the second Cistercian house in northern England, after Rievaulx. The Fountains monks became subject to Clairvaux Abbey, in Burgundy which was under the rule of St Bernard. Under the guidance of Geoffrey of Ainai, a monk sent from Clairvaux, the group learned how to celebrate the seven Canonical Hours according to Cistercian usage and were shown how to construct wooden buildings in accordance with Cistercian practice. After Henry Murdac was elected abbot in 1143, the small stone church and timber claustral buildings were replaced. Within three years, an aisled nave had been added to the stone church, and the first permanent claustral buildings built in stone and roofed in tile had been completed. In 1146 an angry mob, annoyed at Murdac for his role in opposing the election of William FitzHerbert as archbishop of York, attacked the abbey and burnt down all but the church and some surrounding buildings.The community recovered swiftly from the attack and founded four daughter houses. Henry Murdac resigned as abbot in 1147 upon becoming the Archbishop of York and was replaced first by Maurice, Abbot of Rievaulx then, on the resignation of Maurice, by Thorald. Thorald was forced by Henry Murdac to resign after two years in office. The next abbot, Richard, held the post until his death in 1170 and restored the abbey’s stability and prosperity. In 20 years as abbot, he supervised a huge building programme which involved completing repairs to the damaged church and building more accommodation for the increasing number of recruits. Only the chapter house was completed before he died and the work was ably continued by his successor, Robert of Pipewell, under whose rule the abbey gained a reputation for caring for the needy. The next abbot was William, who presided over the abbey from 1180 to 1190 and he was succeeded by Ralph Haget, who had entered Fountains at the age of 30 as a novice, after pursuing a military career. During the European famine of 1194 Haget ordered the construction of shelters in the vicinity of the abbey and provided daily food rations to the poor enhancing the abbey’s reputation for caring for the poor and attracting more grants from wealthy benefactors. In the first half of the 13th century Fountains increased in reputation and prosperity under the next three abbots, John of York (1203–1211), John of Hessle (1211–1220) and John of Kent (1220–1247). They were burdened with an inordinate amount of administrative duties and increasing demands for money in taxation and levies but managed to complete another massive expansion of the abbey’s buildings. This included enlarging the church and building an infirmary. In the second half of the 13th century the abbey was in more straitened circumstances. It was presided over by eleven abbots, and became financially unstable largely due to forward selling its wool crop, and the abbey was criticised for its dire material and physical state when it was visited by Archbishop John le Romeyn in 1294. The run of disasters that befell the community continued into the early 14th century when northern England was invaded by the Scots and there were further demands for taxes. The culmination of these misfortunes was the Black Death of 1348–1349. The loss of manpower and income due to the ravages of the plague was almost ruinous. A further complication arose as a result of the Papal Schism of 1378–1409. Fountains Abbey along with other English Cistercian houses was told to break off any contact with the mother house of Citeaux, which supported a rival pope. This resulted in the abbots forming their own chapter to rule the order in England and consequently they became increasingly involved in internecine politics. In 1410, following the death of Abbot Burley of Fountains, the community was riven by several years of turmoil over the election of his successor. Contending candidates John Ripon, Abbot of Meaux, and Roger Frank, a monk of Fountains were locked in conflict until 1415 when Ripon was finally appointed, ruling until his death in 1434. Under abbots John Greenwell (1442–1471), Thomas Swinton (1471–8), John Darnton (1478–95), who undertook some much needed restoration of the fabric of the abbey, including notable work on the church, and Marmaduke Huby (1495–1526) Fountains regained stability and prosperity. At Abbot Huby’s death he was succeeded by William Thirsk who was accused by the royal commissioners of immorality and inadequacy and was dismissed as abbot. He was replaced by Marmaduke Bradley, a monk of the abbey who had reported Thirsk’s supposed offences, testified against him and offered the authorities six hundred marks for the post of abbot. In 1539 it was Bradley who surrendered the abbey when its seizure was ordered under Henry VIII at the Dissolution of the Monasteries. The abbey precinct covered 70 acres (28 ha) surrounded by an 11-foot (3.4 m) wall built in the 13th century, some parts of which are visible to the south and west of the abbey. The area consists of three concentric zones cut by the River Skell flowing from west to east across the site. The church and claustral buildings stand at the centre of the precinct north of the Skell, the inner court containing the domestic buildings stretches down to the river and the outer court housing the industrial and agricultural buildings lies on the river’s south bank. The early abbey buildings were added to and altered over time, causing deviations from the strict Cistercian type. Outside the walls were the abbey’s granges. The original abbey church was built of wood and "was probably" two stories high; it was, however, quickly replaced in stone. The church was damaged in the attack on the abbey in 1146 and was rebuilt, in a larger scale, on the same site. Building work was completed c.1170. This structure, completed around 1170, was 300 ft (91 m) long and had 11 bays in the side aisles. A lantern tower was added at the crossing of the church in the late 12th century. The presbytery at the eastern end of the church was much altered in the 13th century. The church’s greatly lengthened choir, commenced by Abbot John of York, 1203–11, and carried on by his successor terminates, like that of Durham Cathedral, in an eastern transept, the work of Abbot John of Kent, 1220–47. The 160-foot-tall (49 m) tower, which was added not long before the dissolution, by Abbot Huby, 1494–1526, is in an unusual position at the northern end of the north transept and bears Huby’s motto ‘Soli Deo Honor et Gloria’. The sacristry adjoined the south transept. The cloister, which had arcading of black marble from Nidderdale and white sandstone, is in the centre of the precinct and to the south of the church. The three-aisled chapter-house and parlour open from the eastern walk of the cloister and the refectory, with the kitchen and buttery attached, are at right angles to its southern walk. Parallel with the western walk is an immense vaulted substructure serving as cellars and store-rooms, which supported the dormitory of the conversi (lay brothers) above. This building extended across the river and at its south-west corner were the latrines, built above the swiftly flowing stream. The monks’ dormitory was in its usual position above the chapter-house, to the south of the transept. Peculiarities of this arrangement include the position of the kitchen, between the refectory and calefactory, and of the infirmary above the river to the west, adjoining the guest-houses. The abbot’s house, one of the largest in all of England,is located to the east of the latrine block, where portions of it are suspended on arches over the River Skell.It was built in the mid-twelfth century as a modest single-storey structure, then, from the fourteenth century, underwent extensive expansion and remodelling to end up in the 16th century as a grand dwelling with fine bay windows and grand fireplaces. The great hall was an expansive room 52 by 21 metres (171 by 69 ft). Medieval monasteries were sustained by landed estates that were given to them as endowments and from which they derived an income from rents. They were the gifts of the founder and subsequent patrons, but some were purchased from cash revenues. At the outset, the Cistercian order rejected gifts of mills and rents, churches with tithes and feudal manors as they did not accord with their belief in monastic purity, because they involved contact with laymen. When Archbishop Thurstan founded the abbey he gave the community 260 acres (110 ha) of land at Sutton north of the abbey and 200 acres (81 ha) at Herleshowe to provide support while the abbey became established. In the early years the abbey struggled to maintain itself because further gifts were not forthcoming and Thurstan could not help further because the lands he administered were not his own, but part of the diocesan estate. After a few years of impoverished struggle to establish the abbey, the monks were joined by Hugh, a former dean of York Minster, a rich man who brought a considerable fortune as well as furniture and books to start the library. By 1135 the monks had acquired only another 260 acres (110 ha) at Cayton, given by Eustace fitzJohn of Knaresborough "for the building of the abbey". Shortly after the fire of 1146, the monks had established granges at Sutton, Cayton, Cowton Moor, Warsill, Dacre and Aldburgh all within 6 mi (10 km) of Fountains. In the 1140s the water mill was built on the abbey site making it possible for the grain from the granges to be brought to the abbey for milling.Tannery waste from this time has been excavated on the site. Further estates were assembled in two phases, between 1140 and 1160 then 1174 and 1175, from piecemeal acquisitions of land. Some of the lands were grants from benefactors but others were purchased from gifts of money to the abbey. Roger de Mowbray granted vast areas of Nidderdale and William de Percy and his tenants granted substantial estates in Craven which included Malham Moor and the fishery in Malham Tarn. After 1203 the abbots consolidated the abbey’s lands by renting out more distant areas that the monks could not easily farm themselves, and exchanging and purchasing lands that complemented their existing estates. Fountains’ holdings both in Yorkshire and beyond had reached their maximum extent by 1265, when they were an efficient and very profitable estate. Their estates were linked in a network of individual granges which provided staging posts to the most distant ones. They had urban properties in York, Yarm, Grimsby, Scarborough and Boston from which to conduct export and market trading and their other commercial interests included mining, quarrying, iron-smelting, fishing and milling. The Battle of Bannockburn in 1314 was a factor that led to a downturn in the prosperity of the abbey in the early fourteenth century. Areas of the north of England as far south as York were looted by the Scots. Then the number of lay-brothers being recruited to the order reduced considerably. The abbey chose to take advantage of the relaxation of the edict on leasing property that had been enacted by the General Chapter of the order in 1208 and leased some of their properties. Others were staffed by hired labour and remained in hand under the supervision of bailiffs. In 1535 Fountains had an interest in 138 vills and the total taxable income of the Fountains estate was £1,115, making it the richest Cistercian monastery in England. The Abbey buildings and over 500 acres (200 ha) of land were sold by the Crown, on 1 October 1540, to Sir Richard Gresham, at the time a Member of Parliament and former Lord Mayor of London, the father of Sir Thomas Gresham. It was Richard Gresham who had supplied Cardinal Wolsey with the tapestries for his new house of Hampton Court and who paid for the Cardinal’s funeral. Gresham sold some of the fabric of the site, stone, timber, lead, as building materials to help to defray the cost of purchase. The site was acquired in 1597 by Sir Stephen Proctor, who used stone from the monastic complex to build Fountains Hall. Between 1627 and 1767 the estate was owned by the Messenger family who sold it to William Aislaby who was responsible for combining it with the Studley Royal Estate. 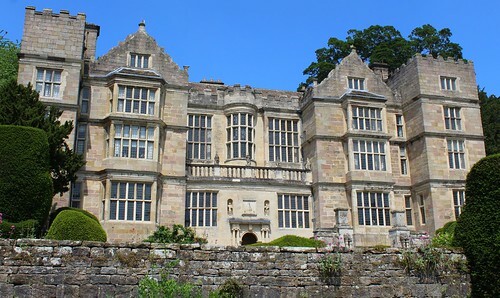 The archaeological excavation of the site was begun under the supervision of John Richard Walbran, a Ripon antiquary who, in 1846, had published a paper On the Necessity of clearing out the Conventual Church of Fountains.In 1966 the Abbey was placed in the guardianship of the Department of the Environment and the estate was purchased by the West Riding County Council who transferred ownership to the North Yorkshire County Council in 1974. The National Trust bought the 674-acre (273 ha) Fountains Abbey and Studley Royal estate from North Yorkshire County Council in 1983. In 1986 the parkland in which the abbey is situated and the abbey was designated a World Heritage Site by UNESCO. It was recognised for fulfilling the criteria of being a masterpiece of human creative genius, and an outstanding example of a type of building or architectural or technological ensemble or landscape which illustrates significant stages in human history. Fountains Abbey is owned by the National Trust and maintained by English Heritage. The trust owns Studley Royal Park, Fountains Hall, to which there is partial public access, and St Mary’s Church, designed by William Burges and built around 1873, all of which are significant features of the World Heritage Site. The Porter’s Lodge, which was once the gatehouse to the abbey, houses a modern exhibition area with displays about the history of Fountains Abbey and how the monks lived. In January 2010, Fountains Abbey and Studley Royal became two of the first National Trust properties to be included in Google Street View, using the Google Trike. Fountains Abbey was used as a film location by Orchestral Manoeuvres in the Dark for their single "Maid of Orleans (The Waltz Joan of Arc)" during the cold winter of December 1981. In 1980, Hollywood also came to the site to film the final scenes to the film Omen III: The Final Conflict.Other productions filmed on location at the abbey are the films Life at the Top, The Secret Garden, The History Boys, TV series Flambards, A History of Britain, Terry Jones’ Medieval Lives, Cathedral, Antiques Roadshow and the game show Treasure Hunt. The BBC Television series ‘Gunpowder’ (2017) used Fountains Abbey as a location.